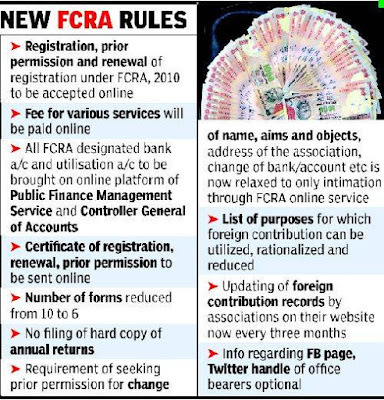 As per amended Foreign Contribution Regulation Rules (FCRR), 2015, all applications for FCRA registration, FCRA prior permission and renewal of FCRA registration under FCRA, 2010, will now be accepted online, with fee for various FCRA services to be deposited through a payment gateway. On its part, the FCRA division of the home ministry will issue digitally signed registration certificates, prior permission sanctions etc to applicants through emails. As per the amended FCRA rules, all NGOs registered or granted prior permission under FCRA are now required to upload details of foreign contributions received and utilized by them every three months on their website or the FCRA website. The new FCRA rules ensure that the human interface with foreign-funded NGOs is minimized, with all queries and replies to applicants to be made through emails. The number of application/intimation forms has been cut from 10 to six, and the number of documents to be attached with applications also significantly reduced. The list of purposes for which foreign contribution can be utilized has been rationalized. NGOs now need to file their annual returns online, with the hard copy version dispensed with. The annual returns must be placed quarterly on the NGO's website or the FCRA website maintained by the home ministry. FCRA registration (or, FCRA Prior Permission) as well as a good FCRA status are compulsory to access any foreign funds by NGOs and Nonprofit Companies working in any part of India. But, due to lack of information or weak communication infrastructure, many NGOs find it hard to get FCRA registration and unsuccessful in maintaining a good FCRA status as well as in accessing FCRA funding. To fill this gap, Ozg in association with the SKF offer the complete FCRA advisory services. Ozg offers a free FCRA consulting to NGOs (Trust / Society), Banks and Nonprofit Companies. It also help them to get enlisted in to the global NGO registry (NGOregistry.com) to access foreign funds.